I was able to utilize freshly harvested carrots from our garden recently for this recipe. (Granted, they were chubby, stubby guys, but still amazing and sweet.) Within minutes of plucking them out of the ground, these orange beauties were roasting in my oven. 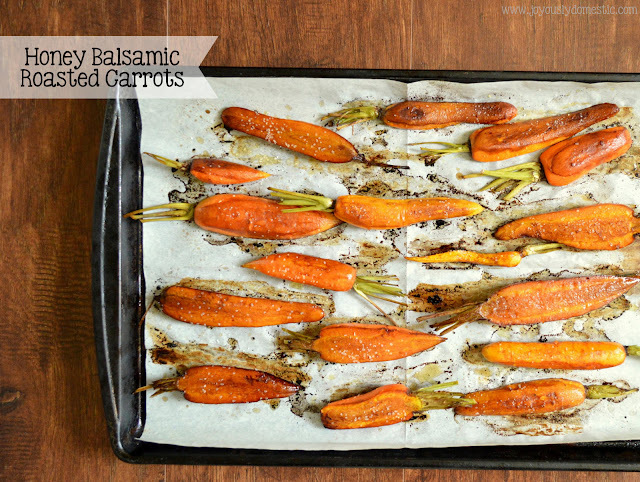 Roasting carrots brings out the natural sweetness and depth of flavor. They make such a fantastic side dish ... one that pairs well with so many main dishes this time of year. This dish shines at holiday dinners, yet its easy and quick prep make it ideal for casual weeknight dinners, too. The cast of supporting characters here are ingredients that I always have on hand in my kitchen. So, while the result is complex and ultra-flavorful in taste, this recipe really couldn't be much more simple and humble. I do recommend using the best balsamic vinegar that you can afford. I adore the tang of balsamic vinegar and love how it plays with the sweetness of the honey in this recipe. As I mentioned, such a simple ingredient list ... but the end result is complex, deep and satisfying on so many levels. Preheat oven to 400 degrees. Line a large sheet pan with parchment paper. Set aside. Roast for 35 - 45 minutes. Flip carrots halfway through roasting. Brush carrots with leftover balsamic mixture a few times throughout cooking. Remove from oven and sprinkle with Kosher salt. Serve immediately. NOTE: Cooking time will vary depending on how firm or soft you prefer your carrots. Also, it will vary depending on how thick or large your carrot are to begin with.